The “Meet the Press” Reception is set to be an informal, intimate gathering for Members of the Press to spend time with Kurt Elling. Press are asked to confirm attendance by Thursday, April 20 so that staff can plan accordingly. Please contact MJF Marketing Associate Jason Arnold at 831/373.3366, cell phone 510/326.4353, or jason@montereyjazzfestival.org to confirm attendance or request more information. Mayor Dan Albert also has a family connection to this year’s Next Generation Festival. The Mayor’s grandson, Brice Albert, is a guitarist in the MJF County High School All-Star Band and will perform at the NGF Kick-Off Concert on Friday, April 21. Grammy-nominated vocalist, vocal arranger and educator Randy Crenshaw will join the stellar cast of Adjudicators at the 2nd Annual Next Generation Festival. Crenshaw is a Los Angeles-based artist with hundreds of major film, television, commercial, and record credits to his name. Over 35 of his award-winning vocal jazz compositions and arrangements are available through University of Northern Colorado Jazz Press based in Greeley, Colorado. His performance experience includes singing country music, arranging for and singing with such groups as Boston-based a cappella quintet “No Strings Attached,” the Berklee Vocal Jazz Choir, a cappella vocal jazz quintet “Terra Nova” (1987 Hennessey Jazz Search grand prize winners), a cappella world beat/R&B sextet “Wahoo Do-Re” (formerly “Vocal Nation”), contemporary Christian vocal group “Haven,” and acclaimed a cappella vocal jazz quartet “Just 4 Kicks” with three recordings released to date on Kickboyz Records. He has earned degrees from Willamette University’s College of Music and Berklee College of Music. Crenshaw joins other NGF Adjudicators including Shelly Berg, Gilbert Castellanos, Paul Contos, Ray Drummond, Rosana Eckert, Mary Fettig, Yoron Israel, Aaron Lington, Andy Martin, Ron McCurdy, James Miley, and Michele Weir. Monterey Jazz Festival will conduct an on-site survey throughout the 2nd Annual Next Generation Festival at the Portola Plaza Conference Center in downtown Monterey, April 21-23. With the help of graduate business students from the Monterey Institute of International Studies under the supervision of Professor Fredric Kropp, researchers will analyze the information from “do-it-yourself” surveys distributed to NGF participants and attendees. Spitzer Music, one of the oldest and most respected retail music companies on the West Coast, has joined with the Monterey Jazz Festival to make the 2nd Annual Next Generation Festival extra special. Throughout the three-day festival April 21-23, Spitzer Music will host a table outside the Steinbeck Forum inside the Portola Plaza Conference Center. Next Generation Festival participants and fans will have the opportunity sign-up to participate in a Guitar Giveaway courtesy of Spitzer Music. One lucky winner will emerge from the Next Generation Festival with a brand-new, high-quality instrument to carry home. Spitzer Music joins NGF Partners J. D’Addario & Company, JazzTimes Magazine, and Tower Records in offering promotional items during the Next Generation Festival. At the D’Addario table, students can help themselves to popular D’Addario music products, while JazzTimes offers free magazines and Tower Records provides a range of complementary promotional items for Next Generation Festival student musicians and music fans. The Monterey Jazz Festival will celebrate its first endowment fund at the opening of its 2nd Annual Next Generation Festival. In a special reception on April 21 closed to the public, the Monterey Jazz Festival will pay tribute to the namesake of it’s MJF County High School All-Star Band Endowment Fund, Monterey musician Bob Phillips. As a pianist, producer and teacher, Bob Phillips has enriched the Monterey musical community for more than 30 years. He has donated countless hours playing pro bono gigs at retirement homes and raising money for displaced New Orleans musicians. He has been honored as Musician of the Year at Dixieland Monterey and Musician of the Year by Seaside Jazz and Arts Commission. Dan Albert, Mayor of Monterey, will participate in the reception on April 21 with a proclamation honoring Bob Phillips for his generous contributions to the music community. Bob’s family and friends have joined the Monterey Jazz Festival to form The Bob Phillips MJF County High School All-Star Band Endowment Fund, which will sustain in perpetuity the Monterey Jazz Festival’s High School All-Star Band Program. Each year, 21 Monterey County high school students are chosen from over 20 schools to be members of the All-Star Band. The Band performs abroad each year, at the Next Generation Festival, and at the Monterey Jazz Festival. The Bob Phillips Endowment Fund will allow every selected child who wants to participate the ability to do so. Contributions for the Bob Phillips MJF County High School All-Star Band Endowment Fund are welcome by check (payable to Monterey Jazz Festival; memo: All-Star Fund), mailing address Monterey Jazz Festival, P.O. Box JAZZ, Monterey, CA 93942. 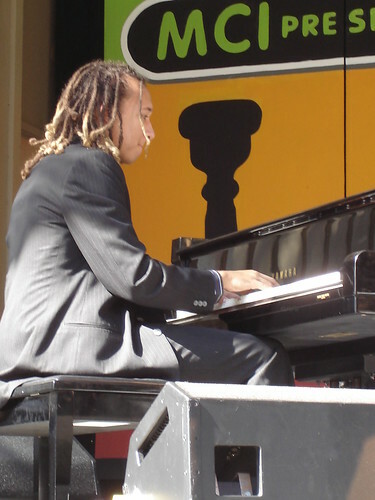 Monterey Jazz Festival is a nonprofit organization and contributions are tax deductible. For more information, contributors may contact MJF Development Director Janice Mantell at 831/373.3366 or janice@montereyjazzfestival.org. This entry was posted on Monday, April 17th, 2006 at 9:36 pm. It is filed under Monterey Jazz Festival, Music News/Info. You can follow any responses to this entry through the RSS 2.0 feed.